Rick Redenius of Cottage Grove, Minnesota was recently announced as the winner of Ram Air’s Hometown Heroes Gear Dryer Giveaway. Redenius was awarded a Ram Air T4-MU Gear Dryer for the Cottage Grove Fire Department—the fire department he serves in. Sponsored by Ram Air Gear Dryer, the 2017 Hometown Heroes Gear Dryer Giveaway marks the second year Ram Air has conducted this sweepstakes. Established as a salute to the firefighters that serve our country, the Hometown Heroes Gear Dryer Giveaway was open to employees, volunteers or retirees of any fire department within the United States of Canada. The contest closed on December 31, 2017. “As a firefighter-owned company, we have a sincere appreciation of preserving the safety of firefighters and those they serve. 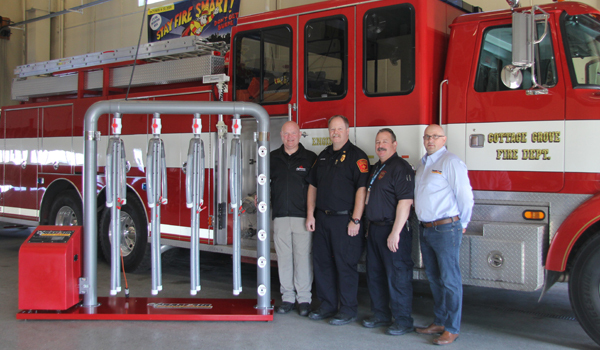 Our gear dryers help reduce the risks associated with dirty, wet gear and, as such, we are thrilled to give the Cottage Grove Fire Department the tools they need to ensure the safety of their firefighters,” said Lance Dornn, president of Ram Air. Chosen from more than 2200 entries, Redenius entered the sweepstakes online after hearing about it at an industry trade show. Cottage Grove Fire Department Fire Chief Rick Redenius (middle left) and and Cottage Grove Fire Department Deputy Fire Chief PJ McMahon (middle right) receive a Ram Air T4-MU Gear Dryer from Lance Dornn of Ram Air (far right) and Scott Bakos of Jefferson Fire (far left), Ram Air’s authorized dealer for Minnesota. The gear dryer was awarded to the Cottage Grove Fire Department as part of Ram Air’s 2017 Hometown Heroes Gear Dryer Giveaway. Photo courtesy of RiverTown Multimedia.